It’s fitting that “The Summit,” as exacting—and excruciating—a portrait of ambivalence as any in The Americans’ annals, should turn on the season’s two stubbornest characters. No ideologue, no doctrinaire, is immune to its unnerving influence: not the artist of agonized women, fighting off suffocation in her final moments as the half-digested morphine pills burble from her mouth, and not her angel of death, either, hesitating a moment before fixing a paintbrush in her patient’s throat and holding her down ‘til she’s lifeless. Erica (Miriam Shor) and Elizabeth (Keri Russell) being Erica and Elizabeth—The Americans being The Americans—the action is wordless, swift, mostly resolute, and yet it’s inevitable—they’re human beings, after all—that doubt should creep in, even if it comes so late in the game it cannot change the outcome. Because, for all the ghastliness of Erica’s death, for all the stoniness Elizabeth displays as she photographs the documents in Glenn Haskard’s (Scott Cohen) briefcase, the signal sequence of “The Summit” is the one that soon follows, in which Elizabeth plans to destroy, then plans to save, Erica’s crimson-edged canvas—and finally, dutifully, sets it aflame, her eyes reflecting the fire. Like one last intake of breath before the grand finale, “The Summit” reflects its central subject, full of quiet divergences. Note that Philip (Matthew Rhys) and Elizabeth’s disagreement in the opening minutes, in which he confesses that he’s reported her activities to Oleg, is pitched at the volume of a furious whisper, or that Elizabeth’s break with Claudia (Margo Martindale) is calm and authoritative. Note, as the pink-slipped Stavos (Anthony Arkin) does, that “whatever was going on in the back room, I never called the police.” Note that Stan (Noah Emmerich), showing Elizabeth’s photograph to a former contact of Gregory’s—a real blast from the past, as is the Roy Rogers in which the meeting occurs—gleans his most compelling clue from the man’s offhand remark that Elizabeth “smoked like a chimney.” (Stan is too straight, or at least too oblivious, to pick up on it, but “incredible hair, like those Vidal Sassoon ads” might as well be on Keri Russell’s “WANTED” poster.) Note that Elizabeth, the series’ iciest figure, still pulls her hand from Jackson’s (Austin Abrams) arm after he finds the bug in the cardboard box, and balks at assassinating the USSR’s top negotiator. This is the episode’s insight into ambivalence, and into Elizabeth, who’s emerged this season, more or less, as the series’ sole protagonist—a development at which “The Summit” playfully nods when Philip goes to the video store and Howard Hawks’ I Was a Male War Bride is playing in the background. As with so much else in The Americans, ambivalence is summative, not sudden: Elizabeth appears to see herself in Erica’s artwork, and their drawing lessons lay the foundation for tonight’s tender mercies; Erica’s suffering, at which even Elizabeth quails, softens her to Jackson’s tears; sparing Jackson’s life creates an opening for Elizabeth to defy Claudia, down to her pointed repetition of “I don’t understand”; refusing Claudia’s orders returns her to Philip, though the damage to their marriage, their trust, may be irreparable. The point is, there’s nothing easy about Elizabeth’s arrival at the moment in which she asks Philip to arrange contact with Oleg, in which the line between betraying her country and saving it begins to evaporate. If the signal sequence of “The Summit” focuses on Erica’s agonized woman, then, its singular composition—perhaps the most telling image of Elizabeth to appear in the entire series—focuses on another, as she listens to Gorbachev’s and Reagan’s emissaries discuss the elimination of nuclear weapons. The back to the camera; the reflection in the smudged mirror; the blank whiteness of the wig mannequin: Here, in one dense, arresting shot, are the many faces of Elizabeth Jennings, spook, enigma, master of disguise. As Agent Aderholt (Brandon J. Dirden) says of the FBI’s composites of their suspects, she’s either all the same people or all different people, and it’s this sense of the human multitudes hidden within her—multitudes that Russell, an early contender for performance of the year, often manages to convey while barely moving her face—that lends Elizabeth such enduring interest as a character. Of course it should be her—the ideologue, the doctrinaire—whose ambivalent loyalties thrust the Jennings, now reluctant allies, once more into danger, all as their cover collapses, their country founders, their neighbor closes in. Of course it should be her—the cold-blooded assassin, the unruffled spy—whose choices in “The Summit,” increment by increment, transform Philip’s admirable sentiment (“It’s on us. All of it.”) into action. 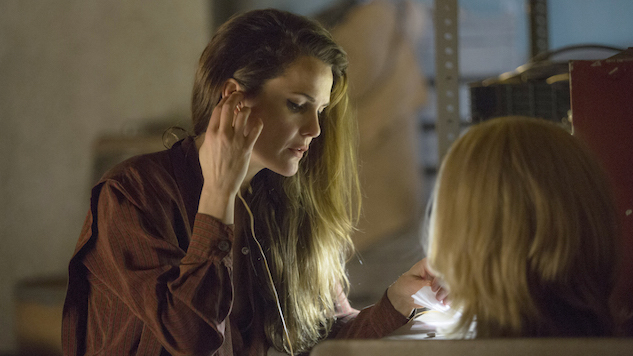 Of course is should be her—the most reluctant American on The Americans—whose quiet divergence from expectation should propel the series to its conclusion. “You don’t think I’m a human being?” Elizabeth asks, wounded, during the disagreement with Philip, but in the profound uncertainties of “The Summit,” she becomes the most human being of all.